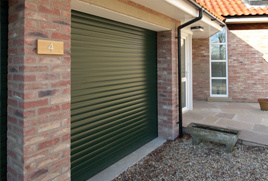 The right garage door has a great impact on the kerb appeal of a home. Gliderol offers you a wide selection of garage door designs, colours, materials, windows and accessories that will compliment any home. And, with our vast network of dealers / distributors, it's likely that a Gliderol dealer is nearby, ready to provide you with the right garage door for your home. 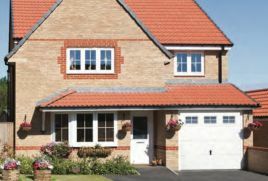 Browse our selection of contemporary and traditional UK made residential garage doors or fill in your details in our enquiry form to the right and we’ll come back to you as soon as possible. Gliderol’s Roller Garage Doors have been designed and manufactured in the UK for over 30 years from strong, corrosion protected steel and are made to suit most garage openings, adding style and character to any home. In addition to being built to operate with minimal noise and friction, Gliderol Roller Doors are specifically designed with a reinforced bottom rail to protect your home against intruders. Gliderol’s Insulated Roller Door is an intelligent design solution creating a smart and stylish door that features vertical travel, insulation, all round weather protection and remote control operation as standard – quite a package! 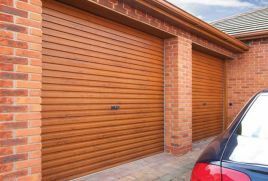 The most compact garage door type, the door rolls neatly around a barrel above the door, using the very minimum of space inside the garage. All Gliderol Sectional Doors comes standard with ball-race bearing roller brackets for long lasting, strong and quiet operation and are available made to measure, at standard prices. 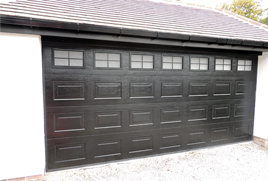 Up & Over Garage doors are a timeless and reliable choice. Choose a style and colour and you have a strong and secure door that will look good for years to come with the minimum of effort.